You could be forgiven for wondering why someone who takes training as seriously as I do "needs" an activity tracker. Of course I don't need one any more than I need a GPS watch, Heart Rate Monitor, etc. But I don't need one much less, either. I was so excited to get one - and it appeared to be fate as I happened to be in the States on the day when the exclusive sales period started at Best Buy - that I went to buy one as soon as I had showered after the Marathon. I remember standing around in the store, still feeling quite queasy, until someone finally came to attend to me. I had been worried I wouldn't make it before they sold out but, for being an exclusive, it was hidden out of sight and nobody seemed to know anything about it! It was going to be my Christmas present to me from my wife but, in the end, I only managed to wait an hour before opening it and giving it to myself (all unbeknownst to my wife). The reasonably sensible reasons for wanting one were to be able to track my sleep quality and resting heart rate to help me to better plan my training, and also to remind me to get up out of my chair and move about. This second reason sounds a bit silly perhaps, because I could just as easily have set an alarm in Outlook, for example, but the daily goal of X steps or Y flights of stairs changes your relationship with moving around. The problems I have been having with my back lately have made me realize that no amount of intense aerobic exercise will help; the real remedy is not to be slouching around in my chair for extended periods of time. After every hour of inactivity it vibrates, telling you to "Move! ", until the so-called move bar has been cleared. I also very much like having notifications á la smart watch. Rather counterintuitively, you end up reaching into your pocket to fiddle around with your phone less if you know you are going to receive an alert for anything interesting, which you can vet on the little screen. Lastly, a feature which would be great for my wife is being able to "find your phone" (assuming it is within Bluetooth range). The less sensible reason for getting one is to have more graphs and metrics to geek out on. For example, I can plot a graph of how my resting heart rate has recovered in the days after the Marathon. It may be a coincidence (time will tell) but it looks as though my resting heart rate is a good indication of how rested I am (duh!). Another reason I am interested in my resting heart rate is because a recent heart study found another anomaly whose name initially worried me - sinusoidal bradycardia - but turns out just to mean very low resting heart rate, and can be common in trained athletes. There has been a lot of speculation over how accurate the optical Heart Rate sensor is. I have chosen to wear the band so that the face is on the inside of my right wrist. That way it looks a little more discreet, which it can do with being (also, I'm not sure I want other people being able to see how fast my heart is beating!). My pulse rate seems pretty consistent but there are times when I notice it up in the 90s and yet don't feel as though I am making any particular effort. I think that this is because it monitors your heart rate more frequently when it detects activity, so that the higher reading is from the last time I moved around; if I am just sitting still (like I am while writing this), it hovers around a fairly constant number. One thing that I have tried to figure out is what the "average resting rate" on the screen refers to. It is different to the one recorded on the website and seems to be very constant, as if it were being averaged since the beginning of time (as far as it is concerned). As you can see, the heart rate graph looks fairly convincing (although I had to tighten the strap one notch to get a reliable reading while running). The step counter was bang on when walking for 30 minutes at a brisk pace on the treadmill the other day, but slightly generous when running at 12 kph. Both of these activities were enough to merit counting as "intense minutes" which are tracked separately (weekly goal: 150 minutes of moderate intensity or 75 minutes of vigorous intensity). If my Fenix 2 watch tends to underestimate my pace by about 20 seconds (slower), the Vivosmart seems to overestimate it by about the same amount in the opposite direction. I have yet to see what happens if I simultaneously record my activity on my GPS watch, but I expect the calories will be double counted by default. I'm not too bothered about this because I am not really worrying about counting them, but some people will be. I imagine that Garmin will address this at some point, if they haven't already. When I get a chance I will compare the same activity with the two, in particular to see how well the heart rate measurement holds up. One nice feature is that it can rebroadcast the heart rate to another (Garmin / ANT+ compatible) watch which can potentially save the need for a chest strap. I would say that anyone training to heart rate will probably require the greater accuracy of the strap but, for those times when you forget it or can't be bothered with it, it's much better than nothing. The only issue would be the extra battery drain. The display is pretty clear, especially when the backlight comes on any time you touch it. Normally it is inverted (i.e., white text on black background) which, like the Fenix 2, looks cooler but is slightly harder to read. The guys at Garmin appear to have found the perfect compromise by switching to a clearer black on white display whenever you put it into running mode. So far it has been a little hit and miss in detecting my sleep times because I like to lie in bed for a while either reading or watching a film. I'm not sure how it could tell the difference between me lying still while watching a movie or lying still while sleeping. You have to indicate a range of hours when you are normally asleep and it does the rest; you can always edit it afterwards. I've also tried to correlate the times when I have woken up in the night with the periods it classifies as light sleep and it more or less makes sense. Compared to its little brother, the Vivosmart, apart from its relatively bulky size, the only extra features it offers are the heart rate monitoring (putting it head to head with the Fitbit Charge HR) and the ability to count floors climbed, using an inbuilt barometric altimeter. Again, it sounds stupid, but you'll find you end up taking the stairs more often as a result. Being properly waterproof gives it the edge over the Fitbit in my opinion. On the downside, the already limited battery life is further reduced to a claimed 5 days (which is even less if you are more active). Still, it doesn't take very long to charge (about an hour) and it's not a bad idea to let your wrist breathe now and again. It syncs much more smoothly via Bluetooth to my (Android) phone than the Fenix 2, which often needs a bit of coaxing to spill the beans on the latest workout. But I have noticed an occasional glitch when the Vivosmart seems to fall out with the phone and stops talking to it. When this happens, the easiest solution I have found (on the Garmin website - so they are aware of it) is to disable and re-enable Bluetooth on the phone. To be fair, this might be an issue with my phone (Samsung Grand 2) rather than with the Vivosmart. One day we will look back at these kind of issues with the same fondness we have for spooling cassette tapes with a pencil that have been ingested by tape recorders. I think that the device has several target audiences. First, those who want to get fit and need some extra motivation. Possibly for them the heart rate feature is a bit overkill, but it bridges the gap between an activity monitor / smart phone and a sports watch. 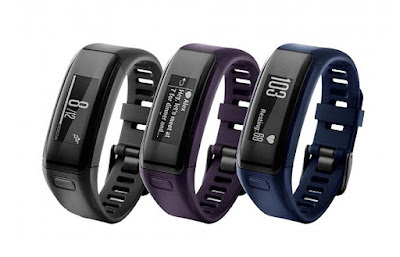 I expect that Garmin's idea is to hook people into their ecosystem (Garmin Connect) via the Vivosmart and hope that people upgrade to the more fancy sports watches and heart rate monitors as they become fitter and more motivated. Another type of customer is the more serious athlete who already has a GPS watch to accurately monitor their training, but wants more information on their general state of wellness in order to be able to optimize that training. Lastly, for those of us that don't yet have a smart watch, it is nice to have those complementary features on a less than watch sized device. Both get the heart rate right but the Vivosmart graph is much more noisy, as you might expect. Still, it is accurate enough to pick up heart rate drift over time and, as long as you ignore the odd anomaly (like the one towards the end of the run), then it looks to be adequate for training purposes. However, a few beats per minute up or down can make a big difference (as I learned not for the first time in the New York Marathon last week) so, personally, I would still only use a chest strap for anything serious. Having said that, the dropout with the HRM Run towards the beginning of the run is something that I have seen happen from time to time, but it is so clearly an anomaly that there is no chance of being confused by it if you happen to look at your watch at the precise instant it is telling you that you are flat-lining. Bear in mind that when you run "in real life" with hills and uneven terrain, your heart rate is never as smooth as on the treadmill. If you want to try to draw any conclusions about training when hills are involved, then it is important not to have any extra noise in the signal. It's taken me a while to get around to this as I find swimming boring at the best of times and, given that I haven't been in the pool for ages, just swimming 20 minutes as I did today seems like an eternity. But the good news is that the Vivosmart HR tracked my heart rate as well underwater as it does on land, which makes it a rather attractive alternative to the Garmin HRM Swim. The only small niggle with using the Vivosmart HR as a Heart Rate Monitor while swimming was that the contact with the water was enough to "swipe" the screen from the heart rate readout to another screen. One solution would be to configure it to only have one screen showing the heart rate, and another would be to pair it with another watch - in my case the Fenix 2 - and to read the heart rate on that screen. I haven't tried pairing them yet but, for this to work well in the swimming pool, the two devices would have to be worn on the same wrist as ANT doesn't travel underwater and, at any one time, one of the devices would be underwater. Lately, the heart rate data while running has been very poor. As my treadmill broke on pretty much the same day as Garmin released a new firmware I don't know whether this is due to running outside where there is more light (obviously) than in my basement or because Garmin screwed something up. DC Rainmaker seems to think that cold weather effects optical heart rate measurements - I'm not quite sure why - so this might also be a factor. As a result, I've not been getting anything like as many "intensity minutes" as I deserve although I should say that I haven't bothered to use the activity mode, instead trusting that the device will notice my vigorous arm movements. I've also noticed more inaccuracies in the step counting as time goes on. I usually get about 250 metres - enough to clear the message telling me to "Move!" first thing in the morning - by cleaning my teeth. The floors climbed reading is usually fairly accurate but today I reached my goal without climbing any stairs or indeed going up more than one floor in the lift: I think it must have been fooled by a combination of my movement and a simultaneous drop in atmospheric pressure (which would have been interpreted as a gain in altitude). I think all activity trackers suffer from these kind of anomalies and, as long as you are consistent (in how many times you clean your teeth, for example), they are pretty good at telling the difference between a busy day and a lazy one. When I see people complaining about their accuracy I think that they are expecting too much and should buy a GPS watch instead. DC Rainmaker has now published his in depth review in which he is quite scathing about its ability to track resting heart rate, which is really the only thing I use it for. My experience has been that it has been quite consistent and correlated well with my general state of fitness. Hopefully, if there are wrinkles here, Garmin will iron them out in the inevitable firmware updates to come. Do you have experience with the Fitbit Charge HR? If so, which do you prefer? There are very few reviews of the Garmin Vivosmart HR right now. I'm afraid I don't but DCRainmaker says that the workout tracking, the display and the waterproofing are much better on the Garmin device. I expect that there will be a whole load of reviews and comparisons coming out soon. Thanks for this. I've spent some time looking for a review that covers the HRM function in water, and since it's a fairly new device, there are not many. I've made up my mind now about getting this tracker as I do swim at least 3 times a week. I know I can't expect perfect accuracy as would be the case from a dedicated device designed for swimming, but I am hoping to get a good estimate. HI man...Can i ask u few question? do we need turn on RUN icon each time for the band to record our swim or cycling and etc? or it goes by auto?...my band always show me 0 min of intensity, even yesterday i went to swim like one hour but is still ZERO or no activities, SWIMMING panel at my Garmin Connect App also NOTHING records or activities....is my band got pro or i didn't turn on the RUN/timer? sorry i am new, i just got my band yesterday...The reason why i get this band is other band/product (Mi Band/SHINE) always saying we do not do enough exercise (walking/running) but we always busy with gym and cycling. which i hope this band can stop telling me doesn't workout enough...but it seem i don't know how make it work or my band is having technical issue? hope heard from u soon. all that the "run" icon does is make it record an activity (which you can then see separately in garmin connect) and monitor your HR continuously. in normal mode, it monitors your HR periodically but, if it notices you are working hard (either, i believe, from the accelerometer or if your HR is high) then i think it monitors your HR more frequently and should record intensity minutes. i suggest two things: (1) make sure you have set your HR zones correctly in the settings and (2) when you have been swimming / cycling for a couple of minutes and your HR is higher, tap the HR screen so that it takes a new reading. in my case, i never use the run mode as it takes up more batteries: when i am running it always seems to notice and records my HR more often than usual, but less tan continuously, and it always counts a fair number of intensity minutes. with cycling and swimming, it probably needs nudging (by asking it to refresh your HR) as the accelerometer doesn't "notice" you are working out. yes i didn't set anything over the HR Zone, it is 0 (resting) so now already set...Hope it work....Another question is...I notice this Garmin Connect the Swimming and Cycling is all EMPTY...i called the support they says because this Band do not support that area...is that true? OR they are wrong but actually this Band do provide reading for Swimming and Cycling? Well, u cannot expect good support here as they may know very less. Hope u can teach me here....I do notice when i am moving, the intensity min number will blink, don't know what it mean, it just never go up or still ZERO until now. OR maybe the HR setting will help, as tonight i will go for biking. Love to keep in touch with u and do teach me more. No, what i mean the Garmin Connect App, there is one area called SNAPSHOT...both cycling n swimming got no record or ZERO...i ask tech support, they said is empty because Garmin Vivosmart HR is not support for swimming and cycling...Is that true? Do you have numbers at your swim/cycle for your SNAPSHOTS area? Thanks. Dear Sir, i have setup the heart rate, but also tried the RUN button, it do managed to logged my cycling, just no distance information like how many KM (0.00) both device and app also showing ZERO...but i ride like one hour about 10KM...but my intensity min still ZERO...maybe i should return for replacement? or what went wrong again? anyway, thanks for helping. it is just an step counter - it detects your steps by the movement of your arm and uses this to estimate how far you have walked / run. it cannot measure distance traveled on a bike (as i said, you would need a GPS watch for this). but, as far as meeting your goals goes, at least it will record "intensity minutes" if not distance when you are riding / swimming.